I won’t be calling or sending you a card this year, but you already know that, don’t you? It has been almost a year since your transition—or what I affectionally call ‘your graduation day’ (from earth school). Your expansion and lessons for this incarnation complete. I cannot be sad; that would be selfish. I saw your frustrations—exasperations—and vexations prior to your exit. Life did not hold the same pleasures or satisfaction; no words were necessary to explain, I knew. Unexplainable to most, I know you have not left me or anyone dear to you for that matter. I know you are with me always—everyday—and every moment; divinity hidden behind the veil of mystery. Separation only an illusion. We all react differently to death. I must say that I know you are around me more now than when you were here physically as my Father. I know you helped me bury my cat Sasha last October. In my minds-eye, I heard you tell me “go get your gloves and shovel.” We did that together. To confess, it’s not because I ever felt disconnected but, because I know a piece of you has stayed with me and I know you understand more of what I’m about; who I am and what I believe. I know I confused you at times; but that is ok too. You get me now. Your understanding has clarity. You exist in a quantum expression entangled with all here on Earth. We said our good-bye’s in May. I am grateful. I never thought about what an example you were to me; I only hoped that I can impart these qualities to my own two sons. I share that now. Perhaps, that is why we chose these soul relationships this time around? You my father; I your eldest daughter. I am grateful you showed me compassion by your way of being; your gentleness, caring, concern and kindness towards others. I say it kept me sane. This way of being shown through with your customers at Equine House and the way you treated our animals; the horses, adopted dogs and barn cats. You taught me about unconditional love. When I married my now ex-husband, you may not have understood, but you assured me that as long as I was happy—you were happy too. Not all parents can do that. You stepped up when it counted. As a young child and young adult, you always respected us—all of us. You listened and tried your best to solve the crisis at hand; I appreciated that you listened. Sometimes, we just need to be heard; I needed to be heard and you were there. You taught me patience and anticipation. These were lessons while horseback riding, but they apply to life too. I believe now they are a metaphor for how we live. They were not fearful warnings, but common sense practical guidance. It works as well today, as it did decades ago. I know life is a wheel—constantly moving up and down. Cycles within cycles; patience is key—so is trust. You taught me that too. You taught me about the simplicity of the the small pleasures perhaps the real secret to life; that satisfaction from within. The value of spending time with your children. The side trips along small winding country roads back to the barns from the feed store or the hardware store. You held the space for the family vacations; that once a year camping excursion to The Big Woods camp ground, the Calgary Stampede, Grand Tetons or Yellowstone Park. Thank you. I too shared adventures with my sons while they were young. I know they will one day look back fondly—just as I look back fondly now. It could have been yesterday. Most recently, I discovered you always loved to finish your dinner with a dessert. I never realized that growing up; maybe everything was lost in the hustle of school and hurried family dinners. It was only when I visited those few weeks each year, I discovered this nugget. I understand Grandfather was like that too—the apple never falls far from the tree. (smiling) There was a child-like pleasure when Linda ( your wife) and I announced we had a sweet-treat to complete the meal baking in the oven. A twinkle in your eyes, and smile as a child like innocence couldn’t contain the excitement over the confection presented; an image indelibly seared forever in my mind. I recall the bakery that we used to visit every trip to Washington in La Conner; that delicious apple dumpling—more like a single serving apple pie! How cool is that Dad? I found a recipe on line. I know you’ll enjoy it with me—when I make it at home! And so, on this Father Day—I know you view the world differently these days from your new vantage point; I don’t know how that looks. You know what I am thinking. You know more about me than I know about myself. You know many of the secrets of the Universe that I would love to know—and that’s ok. I’ll wait. But, one thing I do know, is love is something that rends the veil. It is a multidimensional attribute. And so, from my soul to yours, I wish you Happy Father’s Day—and Thank you for being you! Recorded in the history of earth and humanity—that will never change and always be part of who we are—and who we have been and for that I can celebrate this day and all Fathers’ Days to come! Apple Dumpling ala mode, La Conner Bakery, La Conner, Washington. Me, holding his horse as a young colt. As most of you know from my Facebook post, on July 6th, I unexpectedly and suddenly lost my loving, gentle, and kindhearted father. He was 84. The obituary in the paper began . . . the gentle giant. . . I never saw him that way, but many did with his 6’6” stature. I just knew him as ‘Dad.’ The services were Monday, July 13th—the day after my 58th birthday. At the funeral services many different ideas and beliefs surfaced as we all directly faced the question of death and mortality. I realized this as a spontaneous mini-exposé in front of those gathered, speaking at the microphone that my father would be back. I would know him, I continued, this time playing on the playground, laughing and joyful—perhaps as my grandson—and we would recognize each other when I saw his eyes; the windows to the soul. Life is a continuous circle with —no beginning and no end. We are eternal and forever and as old as the cosmos. In esoteric circles it is accepted that we most often reincarnate in karmic (old term) or akashic groups. As close family and friends gathered in the small Weller chapel together; we witnessed, his journey as Charles complete. And those he touched were tearful as we said our good-byes; big or small, he had touched us all. Who was he? And, who are we? Each milestone always begs questions, bigger questions from us all, does it not? I share what resonates; it may or may not with you—but this is my truth. God doesn’t change; we do. Try it on. Does it make you feel better? More at peace? Or does it shake your belief system? Make you uncomfortable? It is not meant to; these ideas are meant to bring peace. Remember these are just words and thoughts—nothing harmful or anything to fear—ideas, that’s all. If we look back in history, we are aware of other belief systems that at one time were true—only to be replaced by updated ideas and new systems of belief. Two of my favorites are when we as humanity believed the earth was flat, or that germs did not exist, only because we could not see them; they were there all along. We think differently today. Is this multi-dimensional view simply the next step in an evolutionary process of human consciousness and acknowledging the god within? Perhaps a growth, expansion and awareness of our individual divinity? That we are the light? Could it be as simple as putting down our elementary school primer—and graduating to a high school or college text? I ask you to ponder this possibility. Of course, there will never be any proof until we take our last breath and our own journey across the veil transferring our energy to our real state—our home; the great central sun. A metaphor I like. Great because it’s about our angelic magnificence. Central because it’s inside us and everywhere. Sun, because we’re light and part of the creative source we call god. What a grand vision. We must each use our own discernment—even stepping back from what our intellect “knows.” These ideas come with a deep knowing and intuitive understanding about our ‘temporary state’ here on the earth plane—certainly part of a much bigger picture than we could possibly imagine or possibly fit into our small linear 3-D brown corrugated box on the earth plane within the multi-verses we have occupied. Each life we live brings its own story, lessons, “tests”, wisdom and compassion. Entangled together like a collected ball of yarn with many colors and textures, our reality more akin to a grand and classic Shakespearean play. Knowing when the curtain goes down, the one with the knife in his chest gets up and bows with the rest—going on to the cast party afterward to celebrate the success of the play. Death is like that too. In his life as Charles, my father was a poet and author. He was a horseman. He was a father to four children—a husband—a son—and a brother. He served his country. He loved his garden roses. Red was his favorite color. He delighted in meeting others and hearing their stories. He loved cars. He loved to laugh. He loved his family— fascinated in discovering his ancestral linage. He loved to wear ties and his collection was vast and varied; fun and meaningful to him. He delighted in history, quirky humorous movies and the Washington Huskies, never missing an opportunity to don his purple and gold in his later years. But, that is only part of our story. It is a story of our linear bias and human mind. It is a story that we tell ourselves and it has purpose. But what if it was far grander than our human eyes could see? What if this was all about learning and growing? The planet of free choice and discovering the magnificence inside and our god piece, raising the vibration and the consciousness of our planet? What if this is a catalyst for even more growth and learning; not only for us here on earth but for our cosmic family—in a mission of love? What if it could open our eyes to something bigger—if we are only willing to look? I know he is around me. I feel a glow around my heart. There has been an transference of energy and he exists simply at a different vibration; he views my colors now. I wish I could see his colors—but that is not my gift as Cathrine. Einstein taught and left us the iconic phrase ‘energy cannot be created or destroyed.’ Therefore, even science acknowledges he is around me always in that quantum multidimensional state, which restricts our full understanding of our grandness in our limited human form and perception of our multi-dimensional state. When I am sad, I think of this. I think of all the wonderful memories we shared as Father and Daughter. “You had a special relationship with your Dad.” my cousin wrote in his condolence card. We did. I hadn’t realized it was so visible to others; energy is that way. So is love. The last gift he left me was a birthday card; he loved cards. As he lay in the hospital, my birthday was a week away. Did he know he was not going to be here to share cake and blow out candles? He sent his wife home to retrieve his cards; he selected one for me. 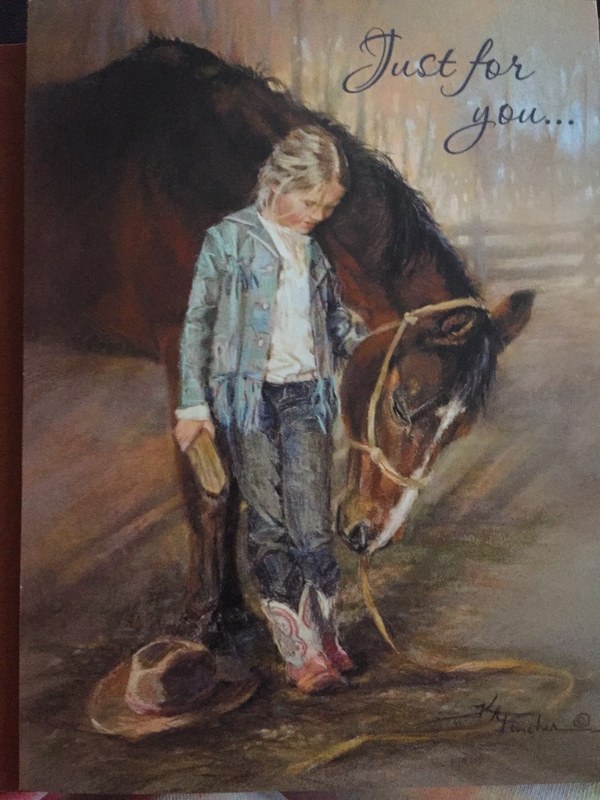 A young girl and her horse; that was me. 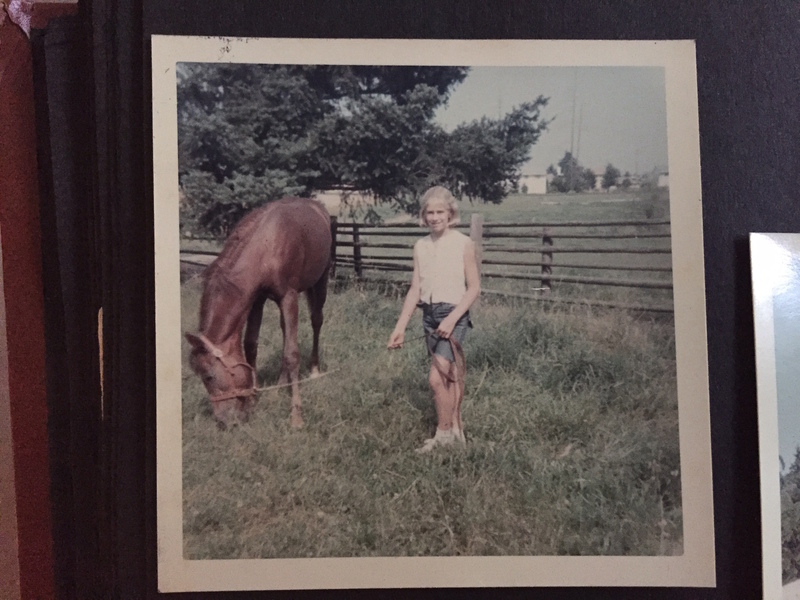 The early memories we shared were remarkably simple: trips to the feed store—getting hay—repairing fences—doctoring horses—the farrier—Dairy Queen. Those easy simple times that meant the most to me as the years passed. I told him so. He kept me sane I confessed. The happiest memories of my childhood—and the freedom I felt at the “Barns.” Perhaps it was the same for him too? I feel a glow around my heart. I know it is him. He is always with me. We are eternal and forever in both directions. We have traveled many times before. He graduated first. One day it will be my turn. We are not finished. We have work to do on earth. And, he will be back. I know he feels me too and ‘hears’ this message. I can talk to him anytime. Thank you Dad, for all the loving, simple, laughing and compassionate moments. Next time, DQ is on me!